Right now I am very much a smoothie-convert! I used to think they were a bit of a cop-out from a normal breakfast, but my attitude could not be anymore different. Why? Because this particular smoothie has so many nutritional and health-related benefits all in one drink. 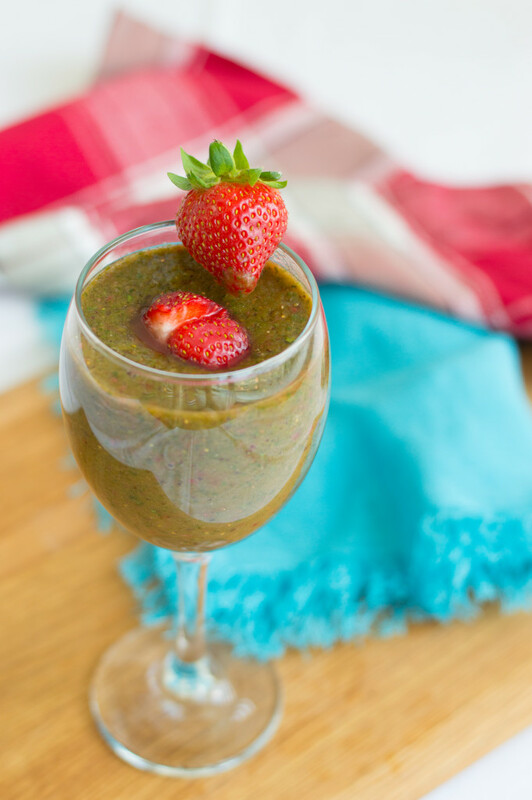 The strawberries and kiwi have plenty of Vitamin C which gives your immune system a real boost, as well as the green vegetables which will help with anti-aging, along with plenty of antioxidants that help fight against certain diseases. Knowing that you can receive such useful properties from 1 glass of this smoothie, I think, is enough to convert anyone to them. Plus the taste is great! So enjoy this Strawberry Green Smoothie Machine of a drink! Add the ingredients to a large enough blender. Blend on a medium speed for a few seconds until smooth. Enjoy! Thank you for all of your lovely comments Maggie, much appreciated!